Want to know what it’s like to be an IUPUI student? Our Campus Ambassadors will answer all your questions during our daily campus tours. We offer two-hour guided walking tours for prospective undergraduate students and their families on weekdays and Saturdays. Space is limited, so be sure to reserve your spot early. If you want to participate in a tour that takes place less than 48 hours from the time you’re making your reservation, please contact Campus Visits at 317-274-4591 or visit@iupui.edu to reserve your spot. Weekdays: 10 a.m. and 2 p.m. There may be exceptions to these days and times, so be sure to consult the reservation system for tour availability. Check-in takes place in the lobby of the Admissions Center (room 255 of the Campus Center) 30 minutes before the tour’s scheduled start time. You’ll check in for your tour at the Admissions Center, located in room 255 of the Campus Center, 30 minutes before the tour’s scheduled start time. 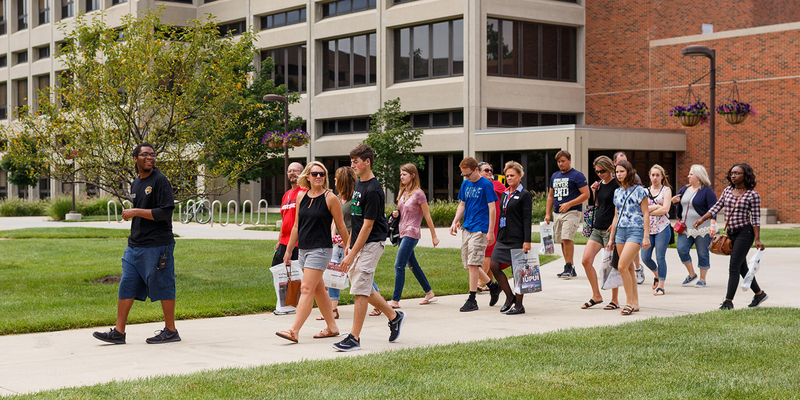 During the two-hour tour, you’ll visit the Campus Center, residence halls, academic buildings, the University Library, and other points of interest. And as our Campus Ambassadors show you around, they’ll share their own experiences at IUPUI and answer all your questions about Jaguar life. Tours take place rain or shine. Be sure to dress appropriately for the weather, since you’ll be spending time outdoors. And don’t forget to wear comfortable shoes—you’ll be on your feet the whole time.